In 10-inch skillet, melt butter over medium-high heat. Add onion, celery and carrots; cook, stirring occasionally, until tender. In large bowl, mix bread cubes, parsley, poultry seasoning, salt and pepper. Add broth and butter-onion mixture, stirring until desired moistness (stuffing will become a little more moist during roasting because it will absorb juices from turkey). Use to stuff 1 (14- to 18-lb) turkey. After stuffing turkey, place any remaining stuffing in 1- or 2-quart casserole that has been sprayed with cooking spray; cover and refrigerate. Bake stuffing in casserole with turkey for last 35 to 40 minutes of roasting time or until thoroughly heated. Day-old soft bread cubes can be substituted for the dry bread cubes. Decrease the broth to about 1/4 cup. VARIATIONS: Cornbread Stuffing: Use crumbled baked cornbread for part or all of bread cubes. Decrease poultry seasoning to 1 teaspoon. Cornbread stuffing is also good with the sausage variation. Mushroom Stuffing: Cook 1 cup sliced or chopped fresh or drained canned mushrooms with onion and celery. Oyster Stuffing: Simmer 1/2 to 1 pint (1 to 2 cups) oysters with liquor for about 5 minutes or until oysters are set; drain. Chop oysters; add to stuffing. Sausage Stuffing: In 8-inch skillet, brown 1/2 lb pork sausage; drain, reserving drippings. Add sausage to bread cube mixture. Decrease poultry seasoning to 1 teaspoon and salt to 1/4 teaspoon (sausage is highly seasoned). Drippings can be substituted for part of butter used to cook onion and celery. Come the end of November, turkey stuffing makes an appearance on dining room tables across the country. You can count on it to signal the official start of the holiday season, as it plays a supporting role next to the ever-impressive Thanksgiving turkey. For some, turkey is the star of the show. And for others, it’s the stuffing. If you’re a stuffing lover, this recipe makes it easy to indulge whenever the craving strikes. 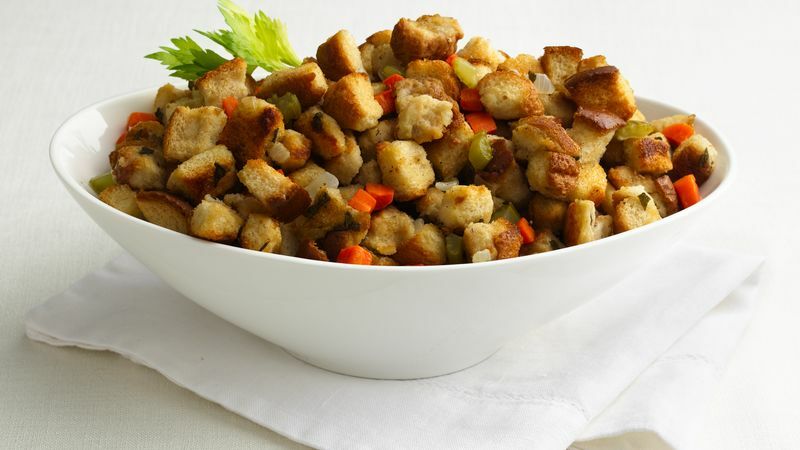 Do you consider yourself a true stuffing aficionado? Feast your eyes on a complete list of Betty’s stuffing and dressing recipes.